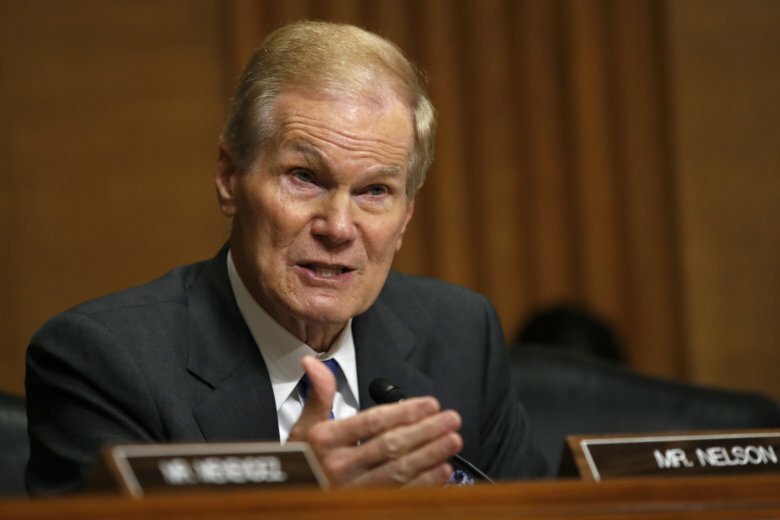 MIRAMAR, Fla. (AP) — Democratic Sen. Bill Nelson and Republican challenger Gov. Rick Scott met Tuesday in a spirited debate in their campaign for Florida’s highly competitive U.S. Senate seat, with Scott labeling his opponent as a do-nothing senator and Nelson claiming the governor was distorting his record. The event, recorded at the studios of Telemundo 51 in Miramar, will air at 7 p.m. in South Florida, Tampa, Orlando, Fort Myers and West Palm Beach. It can also be viewed on Telemundo’s website. Scott, who must leave the governor’s office because of term limits, repeatedly said in answer to questions that Nelson had accomplished little on issues ranging from the environment to immigration to Cuba relations, despite decades in the Senate. Nelson is seeking his fourth Senate term. Nelson, however, pointed out that he voted for a comprehensive immigration bill that passed the Senate six years ago but died in the Republican-led House. He said nine of Scott’s television ads on a variety of subjects have been declared false by fact-checking organizations and many of the state’s newspapers. “The governor keeps coming up with one whopper after another. Apparently you never got your mouth washed out with soap for telling a lie,” Nelson said. The two also clashed sharply on gun violence issues, with Nelson stressing he favors a ban on military-style assault weapons and implementing a comprehensive system of background checks. He noted that Fred Guttenberg, whose daughter was slain in the Parkland school shooting, was in the audience. Yet Scott noted that he and the Florida Legislature enacted a broad gun and school safety bill only weeks after the Feb. 14 Parkland shooting. It imposed new age limits on some gun purchases, created a “red flag” provision allowing guns to be seized from someone deemed a threat and sought to get more armed security personnel in Florida schools, among other things. Given Telemundo 51’s large Hispanic audience, many questions from the moderators dealt with Cuba relations, the situation in Venezuela and repression in Nicaragua. Both Scott and Nelson sought to underscore their support for helping Puerto Rico recover from Hurricane Maria, with Nelson noting that he was just endorsed Monday by the island’s governor, Ricardo Rossello. Both campaigns have strongly courted Puerto Ricans, an important voting bloc in Florida. Scott noted that he has visited Puerto Rico eight times since the storm and has taken numerous steps to help, including dispatching National Guard troops, making it easier for Puerto Ricans in Florida to register for school and providing them an in-state tuition waiver for college. “It was never about politics, it was about helping our fellow citizens,” Scott said. The two also differed on the Affordable Care Act, which Nelson wants to keep and strengthen, but Scott calls deeply flawed and costly. They also sparred on environmental problems that Florida has faced for months, such as fish-killing red tides and algae blooms caused by release of polluted water to the coasts from Lake Okeechobee. Nelson said Scott has “disassembled” Florida’s environmental regulations and agencies, heightening the problems that beset Florida beaches. “You see the result. You put pollution in the water, it will grow the algae in the summer,” the senator said. Scott contended that Nelson hasn’t done much in Congress to tackle many of these same problems, including adequate federal funding to fix the aging dike around Lake Okeechobee. “Senator Nelson has got no money to fix the dike at Lake Okeechobee. Zero dollars,” Scott said. The pair also disagreed on the nomination of Judge Brett Kavanaugh to the U.S. Supreme Court, with Scott in favor and Nelson saying he will vote no over the sexual assault allegations leveled by Christine Blasey Ford and other women. Their next debate is scheduled Oct. 16 on CNN.